How to provide water mark text appearance using BannerTextProvider? This following steps guide to implement Water mark support using BannerTextProvider. Drag and drop the BannerTextProvider to the form. Figure 1. 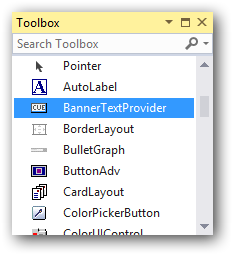 BannerText Provider in ToolBox. The controls loaded in the form will get a BannerTextProvider properties as shown in below. Figure 2. 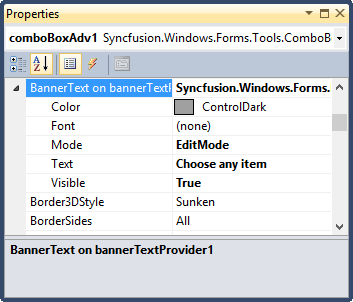 BannerText Provider Properties in ComboBoxAdv. The following code example demonstrates the same. Figure 1. BannerTextProvider shows in TextBoxExt. Figure 2. BannerTextProvider shows in ComboBoxAdv.